Moderate alcohol consumption’s benefits: Blood flow or hormesis? Moderate alcohol consumption has been found again and again to be beneficial to health (, , ). Even somewhat pessimistic studies linking alcohol consumption with health suggest that 6 drinks per week is optimal (). One drink is generally defined as: a 4-ounce glass of wine, a 12-ounce bottle or can of beer, or a 1.5-ounce shot of hard liquor. The amounts of ethanol vary, with more in hard liquor: 4 ounces of wine = 10.8 g of ethanol, 12 ounces of beer = 13.2 g of ethanol, and 1.5 ounces of spirits = 15.1 g of ethanol. Contrary to popular belief, the positive health effects of moderate alcohol consumption have little, if anything, to do with polyphenols such as resveratrol. It is in fact the ethanol content that leads to the positive effects, apparently reducing the incidence of coronary heart disease, diabetes, hypertension, congestive heart failure, stroke, dementia, Raynaud’s phenomenon, and all-cause mortality. Raynaud's phenomenon is associated with poor circulation in the extremities (e.g., toes, fingers), which in some cases can progress to gangrene. Two main explanations for the positive health effects of moderate alcohol consumption are: (a) that it improves blood flow; and (b) that it improves liver function via hormesis. These two explanations are not mutually exclusive and may both be right. The latter explanation is based on the assumption that often a favorable biological response results from low exposures to toxins and other stressors. This is fundamentally a compensatory adaptation response (). It is not very easy to find evidence in favor of the first explanation above – that moderate alcohol consumption improves blood flow. An old study by Fewings and colleagues is a welcome exception. The study was published in 1966 in the British Journal of Pharmacology. It is titled: “The effects of ethyl alcohol on the blood vessels of the hand and forearm in man” (). The figure below, from the study, shows average measures for 5 people who consumed 100 ml of brandy. This is equivalent to about 2 drinks. Each set of points reflects measurements taken at 30-minute intervals. The top graph shows the variation in blood alcohol content over time in mg / 100 ml. 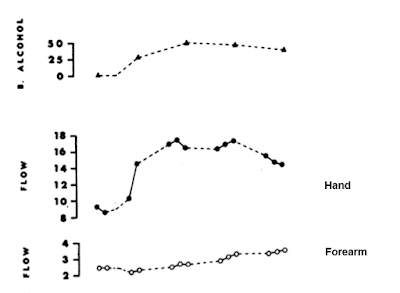 The middle graph shows the variation in hand blood flow over time in what the authors reported to be ml / 100 ml / min. 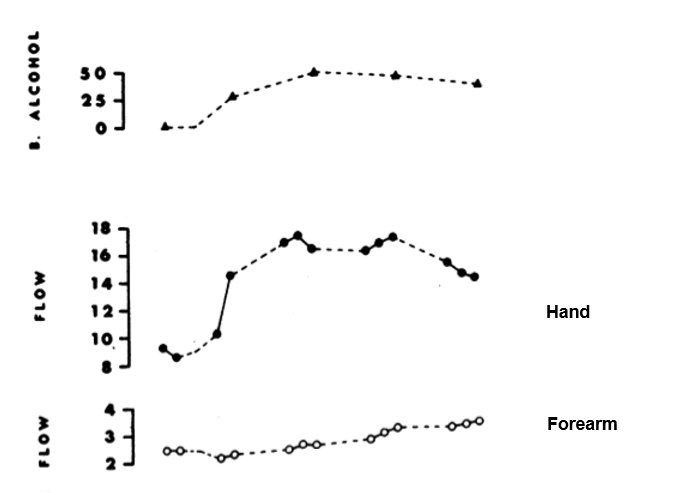 The bottom graph shows the variation in forearm blood flow over time in the same scale as hand blood flow. Many other measures are reported by the authors of the study, including measures in response to direct intra-arterial injection of ethanol. When injected, ethanol appears to have a nonlinear effect, opposite to that of oral consumption at first. Injected ethanol seems to impair blood flow at first, and then improve it significantly after a while. Oral ethanol intake, through drinking alcoholic beverages, is the main focus of this post. The authors also show evidence that the improvement in blood flow maintains itself for more than 2 h, and that flow becomes impaired at very high levels of blood alcohol. So, as we can see, moderate alcohol consumption seems to improve blood flow. Why would this enhance one’s health? One reason is that many important chemicals flow through the blood, which is about 90 percent water. Among these chemicals are free fatty acids, glucose, vitamins, minerals and oxygen. Without these chemicals, organs cannot operate properly, and in fact their tissues may die rather quickly. For example, for normal function the brain requires 3.3 ml / min of oxygen per 100 g of brain mass. Another reason is that impaired blood flow seems to be significantly associated with accelerated atherosclerotic plaque growth, via a phenomenon known as endothelial cell apoptosis ().